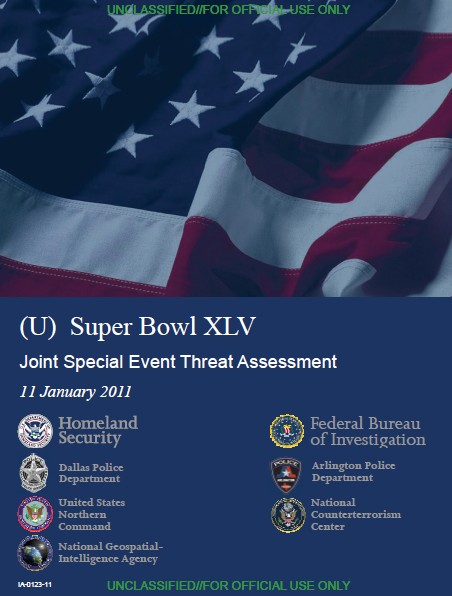 (U//FOUO) This Joint Special Event Threat Assessment (JSETA) addresses potential threats to the National Football League (NFL)USPER Super Bowl XLV, which will be played on 6 February 2011 at Cowboys Stadium in Arlington, Texas. It focuses on potential threats to the game—and to various NFL-sanctioned events scheduled for the Dallas/Ft. 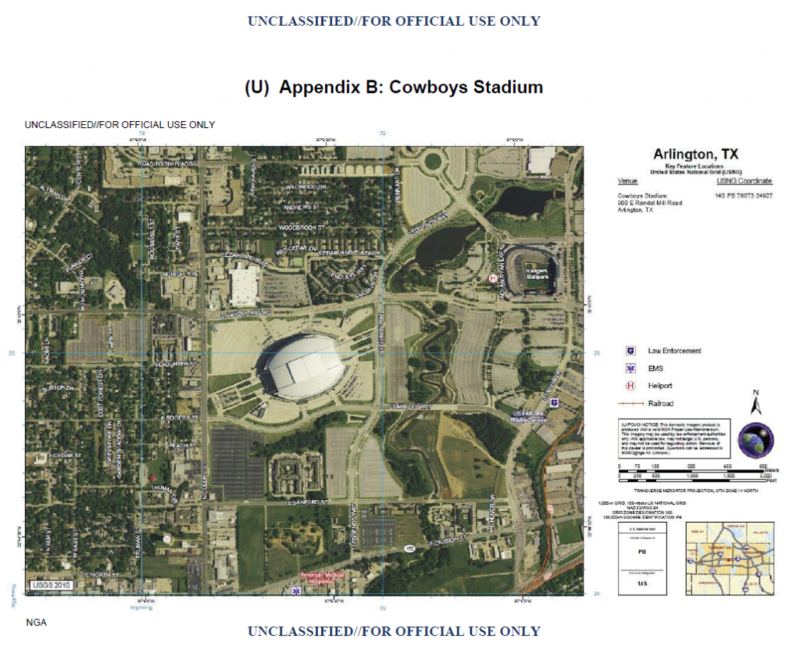 Worth Metroplex-area during the 12 days prior to the game—from international and domestic terrorists, cyber actors, criminals, and foreign intelligence services. (U//FOUO) Information in this assessment is current as of 10 January 2011. Federal, state, and local law enforcement agencies will provide any subsequent threat information received from FBI Intelligence Information Reports, DHS Homeland Intelligence Reports, and FBI Operational Situation Reports, as warranted. (U//FOUO) The FBI, DHS, the National Counterterrorism Center (NCTC), United States Northern Command (USNORTHCOM), the Terrorist Screening Center (TSC), and Dallas/Ft. 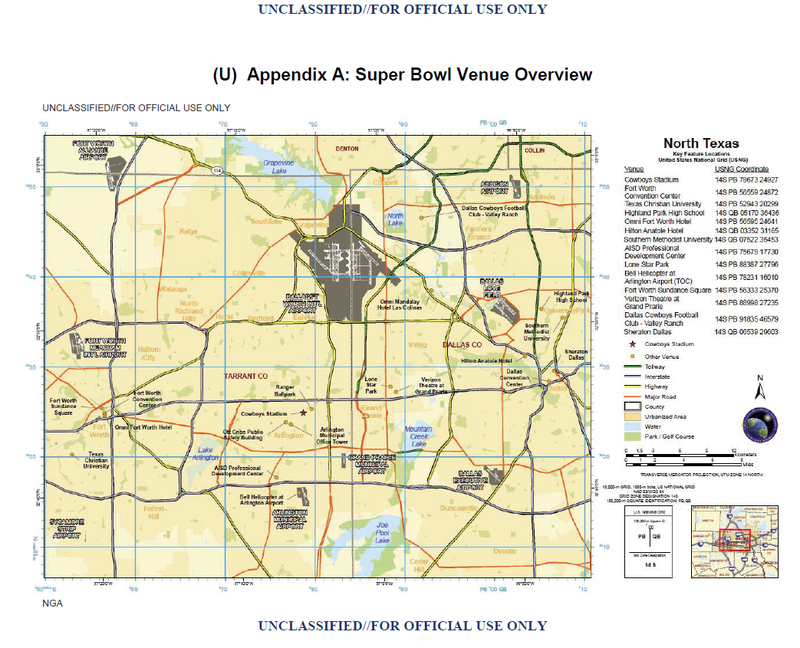 Worth Metroplex-area (DFW-area) law enforcement agencies have identified no credible terrorist threats to Super Bowl XLV or its associated events and venues. Nevertheless, the Super Bowl’s high profile could make it a desirable target for violent organizations or individuals seeking to exploit intense media coverage to promote their cause. (U//FOUO) We assess that the placement of explosive devices in heavily trafficked areas would be the most likely mode of terrorist attack. Security breaches facilitated by stolen or counterfeit credentials or by individuals with legitimate access to the facility pose additional threats to stadium security. (U//FOUO) We have no information indicating any credible cyber or foreign intelligence threats to the Super Bowl. (U//FOUO) The highly visible security presence at the stadium most likely will deter potential attackers. Prospective attackers may view nearby local infrastructure, such as hotels, restaurants, and nightclubs as more feasible targets.